During the build run of Vantage Volantes 27 rather special cars appeared. Based on styling requests submitted by His Royal Highness, the Prince Charles, they became known as Prince of Wales (P.o.W.) 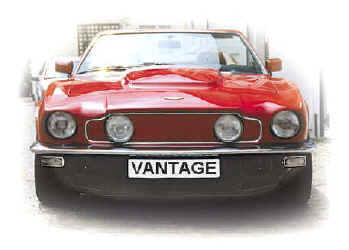 specification Vantage Volantes. Visually they were more subtle in appearance, but not in performance. The Volante’s elegant lines re-appeared without the front air dam, side sill extensions and flip tail (although two were built with this feature) of the somewhat over endowed Vantage Volante. 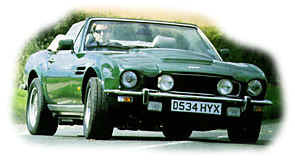 The grille remained open (not blanked off as on the Vantage Volante) and overiders were normally fitted on the bumpers. Prince Charles’ car bore the chassis number V8CHR15581, the last copy built was V8CKR15849. They can be distinguished by a "C" rather than a "V" in the chassis number and a "X" suffix in the engine number. All told 22 P.o.W. spec. cars were built, all right hand drive and manual with V8CHR15834 the exception, being the only automatic. The interior was notable by the absence of an ashtray (HRH doesn't smoke) recessed switches on the console and a large raised center armrest incorporating a cubby box. A Nardi wood steering wheel and gear shift knob were also fitted at the Prince's request. V8COR15819 built for Prince Michael of Kent , a PMoK spec if you like. The full Vantage spec. P.o.W. cars must be the ultimate convertible ever built by Aston Martin and are eagerly sought by collectors. A high price is reflected by their rarity with cars changing hands above the £100,000 level. The demand is such that the factory service department and several Aston specialists have converted standard Volantes to P.o.W. spec. There are probably as many non genuine as there are genuine cars. 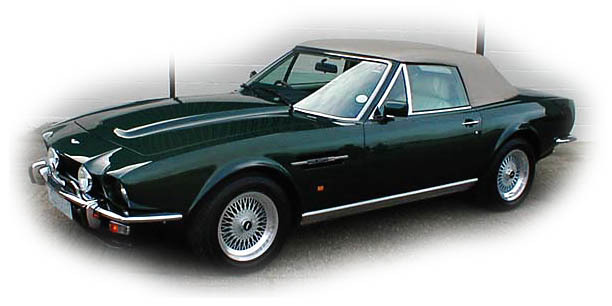 Five "Cosmetic" cars were built for the US market, easily distinguished by the large rubber 5 mph bumpers and catalyzed low compression fuel injected engines producing around 200 bhp versus 409 for the European carburetored Vantage 580X engine. V8CJL15694, V8CJL15714, V8CJL15793, V8CJL15799 were all manuals and V8CJL15782 automatic.